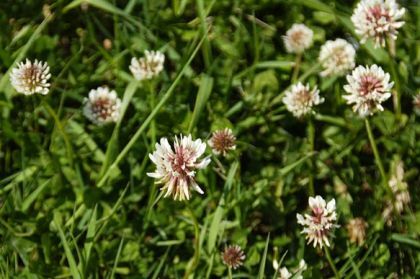 Not beloved by those trying to maintain a perfect lawn, the White Clover plant is an almost hairless plant which spreads by rooting at leaf junctions. Its creamy white flower heads, 8 – 13mm long, are carried in rounded heads 2cm across and are on flower from June to September. These sweetly scented flowers become brown with age after they have given their nectar. The toothed leaves are trifoliate and the leaflets bear white V-shaped marks and translucent veins. This is a native plant and belongs to the family Fabaceae. 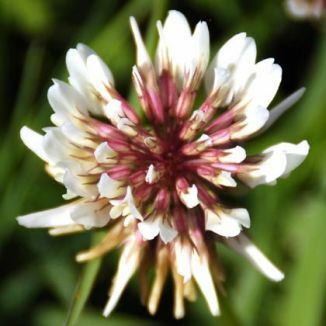 "This Plant is worn by the People in their Hats upon the Seventeenth day of March yearly (which is called St Patrick's Day), it being a current Tradition that by this Three leafed Grass he emblematically set forth to them the Mystery of the Holy Trinity. However that be, when they wet their Seamar-oge, they often commit Excess in Liquor, which is not a right keeping of a Day to the Lord." The occasional four-leafed clover is said to bring the finder luck.